Merry Christmas & Happy Everything! Thanks to all of you who helped make our 14th Birthday Bash a big success. Your generosity was amazing, and we're so pleased that your "birthday" gifts have been donated to Operation Gratitude in support of our military at home and abroad. Our raffle for a Sizzix Vagabond raised an additional $125 to help defray the cost of postage for soldier care packages. Congratuations to long-time customer Doris Wray! Our Creative Connection night meets this Saturday (December 13th) and we have space for more artists. This event is an opportunity for art enthusiasts to gather on a regular basis (monthly) and share the creative process. This is NOT a class; rather, it is a SPACE... for friends to start or finish a project... cards, journals, wall art, etc. Look forward to lots of laughter and fun, and an opportunity for help and collaboration from fellow artists. In addition to a space for you (WARNING--not a table of your own), you will enjoy snacks and drinks; access to the classroom's diecutting machines, dies and texture fades; and, 20 percent off the regular price of all in-stock products. Since the shoppe is open until 9:00 Monday through Saturday from now until December 23rd, we are opening up the studio to our customers for creative play. We will be working on our cards, last minute handmade gifts, and just "playing", and would love to have you join us. Take a break from shopping, baking, and wrapping, and get some one-on-one Zentangle coaching from Patti on Tuesday, make paperdolls with Lolly on Wednesday, watch a gelli plate demo with Terry on Thursday, OR just bring your half-finished projects and enjoy the camaraderie of the season with us. We think it's important right now to remind all of you of the importance of feeding our souls with our art, which helps keep us grounded. We will continue to order new products as they are introduced and restock all your favorites; however, as with all of you, we have had to adjust to the changes in the economy, and have (necessarily) adjusted our restocking intervals to more closely reflect the times. We've seen this trend with our suppliers, our fellow business owners, and our customers, and ask that you work with us to determine how we can best meet your expectations while observing the bottom line. If you have ideas about classes and new products, please forward those to us (queens@queensink.com), as we are trying to plan for the next 6 months... more cards, fewer cards; paper engineering (or not? ); product techniques and demos; whatever ! We want to hear from you, our most valuable resource of all. Patti's promise for the New Year (but beginning now) is to write a Facebook post EVERY day... there's always something to say, right? Go to the bottom of this newsletter and "LIKE" us... don't miss out on her daily musings. She (with a little help now and then) will report on shop happenings, new products, maybe a cool technique she discovers... or anything else that you might suggest to her. Lolly wants you to mail-bomb her inbox if you see that she's reneging on her promise! One last note... we will be closing at 3:00 p.m. on Christmas Eve, so tell those last-minute shoppers in your life that they have a deadline! We just received Seth Apter's workshop descriptions and project photos, so those will be posted in the next few days. workshops. We're so excited to host him the weekend of February 28th-March 1st, during which he will teach a 3-hour workshop and two all-day workshops....all brand new for 2015! Watch Facebook for the big reveal! Yes, it's true.... this blog is woefully out of date. One of the hazards of social media is the requirement for consistency and continuity in posting. That said, I find it extremely difficult to make blogging a priority when I'm pressed with other activities in the shop. Oh, and don't get me started about tweeting... who can actually say ANYTHING in 140 characters...geez, not me! Of course there is news to share, products to tout, classes and projects to describe... but not so much time, it seems. I do endeavor to update our website regularly, including the Products section where I list new products that arrive. 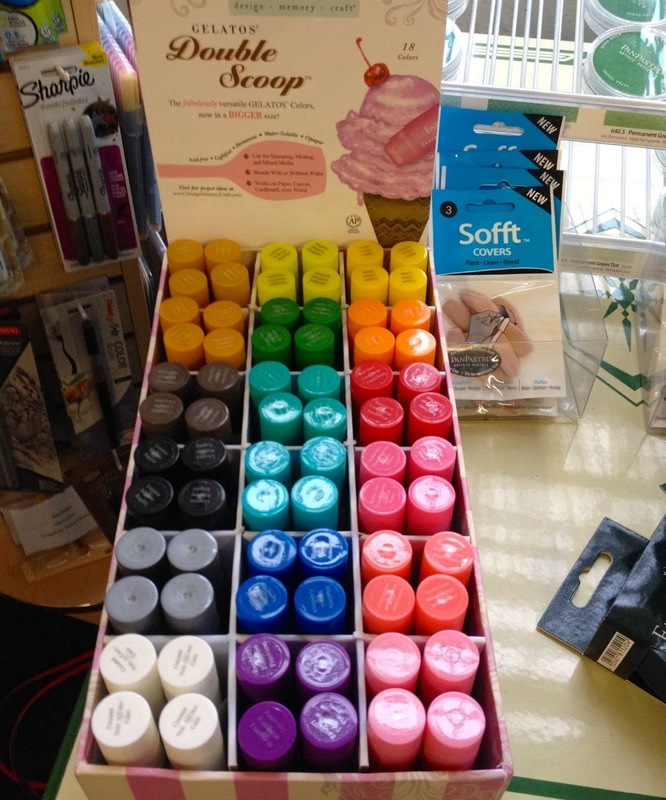 Typically I don't list standard supplies like tape and glue and rulers, but I do post information about new and restock of the various inks, tools, dies, stamps, and ephemera, and I always keep the publications list current, as new editions arrive from Stampington and Interweave. The Classes section of the website is the most used and most edited part of queensink.com, and I update it at least weekly as new workshops are finalized and descriptions/project photos are updated. Please feel free to call and ask about a particular class listed, or let us know about classes you'd like to see in our offerings. 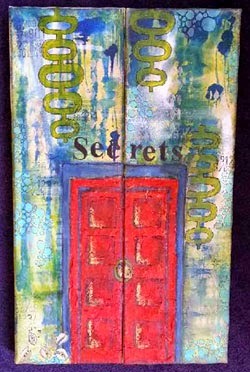 I work with Patti to develop a monthly schedule of classes, both guest artist one-and-done workshops and regularly scheduled classes (tags, Zentangle, Ink Paper Scissors, cigar boxes, etc). We had three great workshops with guest artist Kass Hall in early August, who brought along many examples of her journal pages, sure to awe. Kass lives in Australia, is rather new to the international teaching circuit, and was a delightful guest, including her fun accent. Kass taught a workshop called "Make It Big" during which the students created a two-panel work of art. Patti's finished masterpiece is shown (right). Yesterday, our very own Laura Hummel guided a large group of enthusiastic students through the creation of personal travel journals, complete with partially decorated pages, sewn signatures and a beautiful, unique cover. She provided numerous examples of completed travel journals from her adventures far and wide, in which she documented interesting sites, sounds, people, and included ticket stubs, menus, photos and other memorabilia that she collected and tucked into the journal that lived in her purse for the duration of her trip. What a great way to capture the memories while still fresh! We're looking forward to another class with Laura in September, already nearly full. 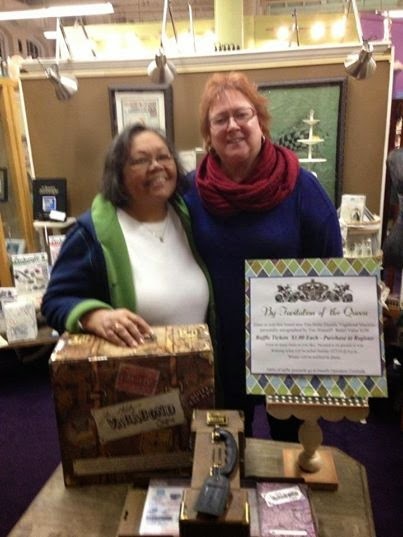 I'm certain we'll convince her to continue offering journal workshops at the shoppe! In the meantime, come for a visit, and watch the website, blog, and Facebook for updates on shop happenings.